A simple teenager Su-ho and the popular pretty Su-Eun start dating. Their young love is the object of much jealousy from other students, but for Su-ho and Su-Eun, their love just seems splendid and eternal. 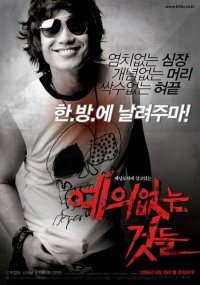 However, Su-ho finds out something tragic about the girl he loves. Desperate for a better life with his younger sister, Yoi (Kim Min-jong) gangs up with "Romantic Warriors", an assassin squad, to make money. The squad, however, consists of dummy assassins who are ignorant of fighting nor martial arts. One day as they are on the way to their assassination big job, they got lost in a forest and stuck in a house haunting spirits of women who died with bitter grudges. Unknowing that the tripped assassins are that amateur, the female ghosts believed that they can make use of them to take revenge on those who killed them.